SpaceX CEO Elon Musk says that Crew Dragon – originally designed to propulsively land like Falcon 9 – is still technically able to do so, a capability that could give the already uniquely redundant spacecraft yet another level of safety during Earth reentry and landing. f it can be done, Crew Dragon would be the only spacecraft in the world with the ability to ensure crew survival in the event of a failure involving parachute deployment, although it’s not clear if that recovery redundancy would still be available after an actual in-flight or pad abort during launch operations. Still, for a space agency so apparently fixated on and worried about ‘qualifying’ SpaceX’s Crew Dragon parachutes and a “Safety first!” culture more generally, one would expect NASA to jump on any opportunity to dramatically improve spacecraft safety with minimal additional effort. Thanks to SpaceX’s decision to permanently integrate the SuperDraco-powered launch abort system (LAS) into the capsule itself, compared to most other solutions with ‘escape towers’ or service section-based abort systems ejected once in orbit or prior to reentry, Crew Dragon can escape from Falcon 9 at any point from the pad to orbit. Boeing’s Starliner capsule also features this capability, although its abort system is integrated into its trunk, which – like Crew Dragon – is detached before reentry, meaning that Starliner would have little to no control authority during descent and recovery aside from small maneuvering thrusters. For Starliner, the potential consequences of a parachute failure during recovery are quite a bit higher than Dragon as a result of Boeing’s decision to land the capsule on land, a process that actually necessitated the inclusion of a complex series of additional deployment events for a successful (and safe) landing. During Starliner landings, the capsule must deploy its drogue chutes and main parachutes (three instead of Crew Dragon’s four), but also has to eject the entire heat shield section and deploy airbags shortly before touchdown. If one or all parachutes failed to properly deploy, Starliner would have no recourse to protect its passengers, while a failure of heat shield deployment or airbags likely would result in significant damage to the spacecraft and potentially injure the crew. While it adds complexity, many other spacecraft – including Russia’s Soyuz capsule and Blue Origin’s New Shepard capsule – rely on actively-cushioned land recoveries, although they typically use small thrusters (usually solid rockets) instead of cushions to achieve a softer touchdown. Still, the fact that Crew Dragon will likely approach its splashdown with several thousand kilograms of propellant still aboard and (nominally) unused SuperDraco thrusters clearly offers a major opportunity for added redundancy and safety, potentially requiring little more than a software update to enable. 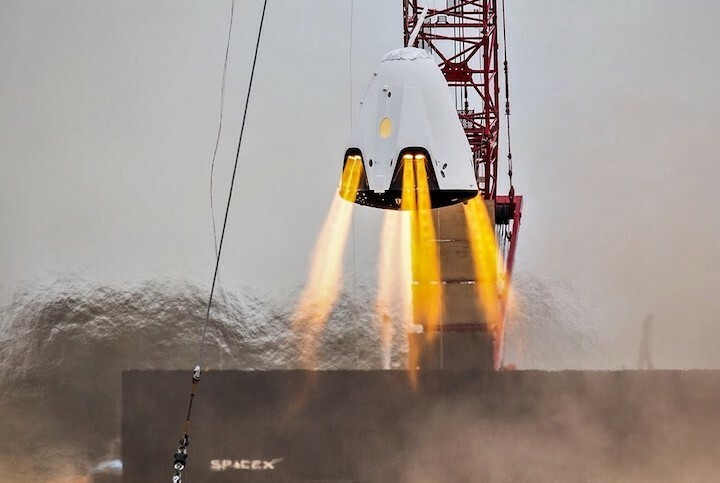 If possible, the opportunities stretch well beyond simply cushioning anomalous ocean splashdowns, potentially allowing for abort scenarios where Crew Dragon would be able to safely return crew to Earth even in cases where the capsule would be forced to land on the ground by using its SuperDracos to cushion what would be an otherwise dangerous crash. 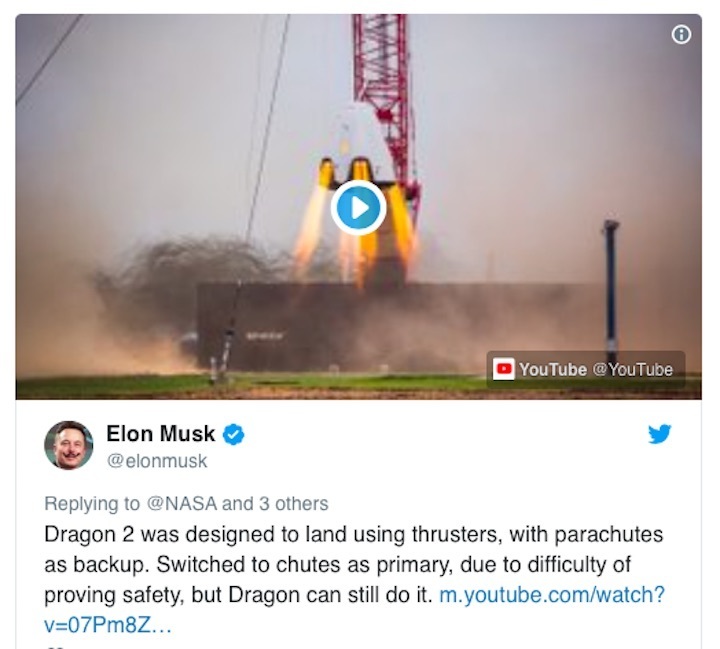 According to SpaceX CEO Elon Musk, the company may actually explore – if not operationally utilize – the capabilities lent by Crew Dragon’s (also known as Dragon 2) abort thrusters, including redundant recovery and propulsive or cushioned landings at sea or on land. SpaceX is set to use refurbished and slightly modified Crew Dragons to fulfill its second Commercial Resupply Services (CRS2) contract with NASA to deliver supplies to and from the International Space Station (ISS).